The few dozen Tucker 48s that ended up getting built came with helicopter engines mounted in the rear. I’m lucky enough to have seen one run, but I’ve never heard of one on the dyno, or how much power one of these things actually puts out. Again, I’ve gotten to see and hear what I believe was this exact Tucker in operation and it’s a genuinely lovely experience. The car has a powerful but reserved thrum to it. Its engine was originally designed for a Bell helicopter, a flat-six Franklin. Tucker’s version of it was 5.5 liters and water-cooled, aiming for low-end power, with a spectacularly low redline. And that’s exactly what’s confirmed in this dyno run. 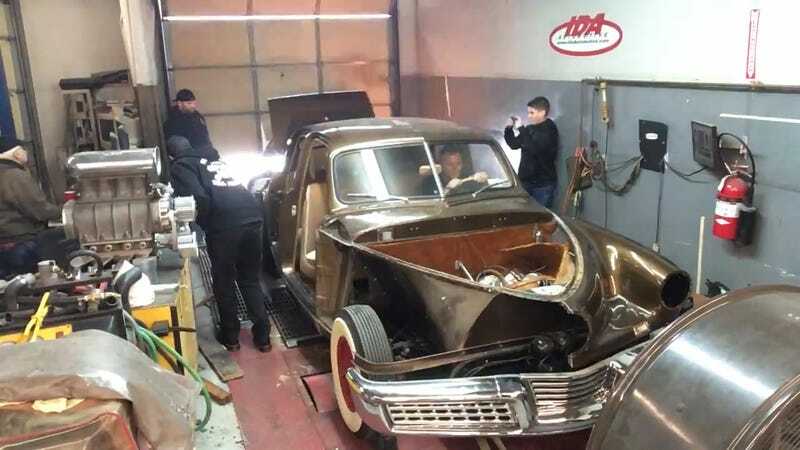 The 44th Tucker put down 94 horsepower and 221 ft-lbs of torque at 2,700 RPM. That’s down from the figure that you usually see thrown around at 150 or 166 horsepower, but it’s still interesting to see how much it prioritizes torque over pure power. The Tucker was an oddball, but it was still American. Did This Online Auction Reveal Preston Tucker&apos;s Never-Made Roadster?